Following their launch of Stuffed Crust Deep! Deep! Dish Pizza earlier this year, Little Caesars debuts new Pepperoni Stuffed Crust Deep! Deep! Dish Pizza. 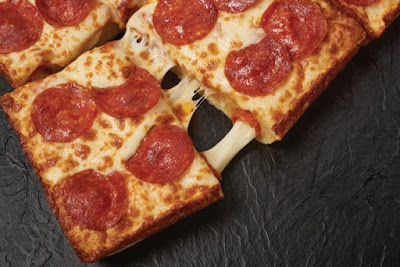 As you might have surmised from the name, the new pizza features their Detroit-style deep dish pizza with a cheese and pepperoni stuffed crust along its edges. It also comes topped with pepperoni by default. According to the chain, if you took all the pepperoni in and on top of the pizza and laid them out flat end-to-end, you'd have over six feet of pepperoni. Little Caesars new Pepperoni Stuffed Crust Deep! Deep! Dish Pizza is available for a limited time at participating locations for $10. From 4 PM to 8 PM, you can get it "Hot-N-Ready" without having to order ahead or wait.